Powerful and illuminating flashlights are a must-have for travelers as well as campers. B﻿﻿right flashlights, or torches as some call them, are essential for night hikes, evening road trips, blackouts, search parties, besides many other practical applications. However, a flashlight will only be as good as its batteries. Also, its batteries will also determine how long it will be useful. Accordingly, when it comes to batteries, the lithium-ion energy in the 18650 battery are at the very top of portable power. For this reason, we specifically searched for the best 18650 battery for a flashlight. Moreover, a great battery must be rechargeable for maximum efficiency and potential savings. Not only did we write helpful battery reviews in this article, but we’ve also included a guide or, primer so we can shed a little light on the 18650 battery. These power cells may look alike, but they will perform differently. Thus, without further ado, let’s take a quick look at the top 5 best 18650 battery for flashlight. Simply put, an 18650 is a type of lithium-ion (or Li-ion) battery. 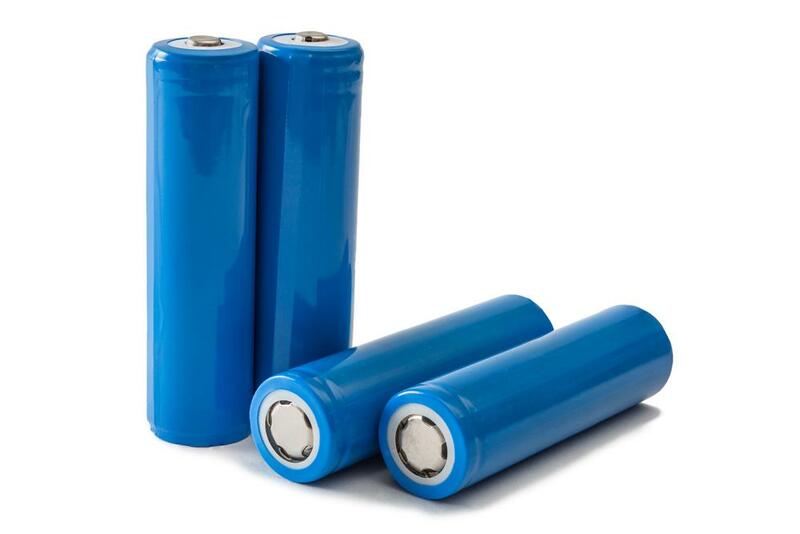 Specifically speaking, the 18650 nomenclature is a size classification of a Li-Ion battery as these cells are 18mm by 65mm in size. Meanwhile, the 0 at the end of the name only classifies its shape as cylindrical. Besides flashlights, you can usually find packs of Li-ion batteries, such as the 18650, in mobile phones, tablets, laptops, cameras, portable power tools, and much more. In Li-ion power cells, the 18650 classification is the most popular. 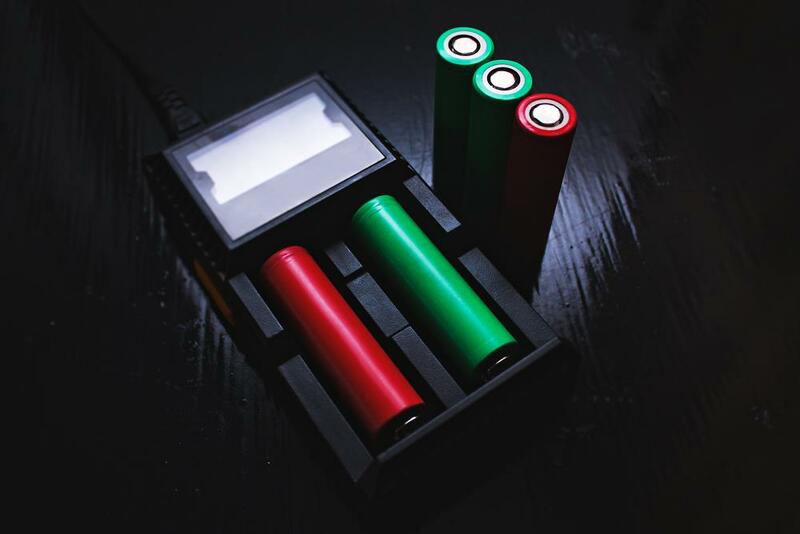 The 18650 batteries are best for flashlights for the same reason that these batteries are best for the other aforementioned portable electronic devices. As you may already know, Li-ion batteries are rechargeable. In addition, though, they also have the benefits of having higher energy stores, lighter weight, as well as greater efficiency, capacities in contrast to non-Li-ion cells. Thus, utilizing an 18650 battery will mean a more powerful flashlight that you can use for much longer while staying lightweight. Although, you should take note that there are specific flashlights which use 18650 batteries as power sources. Hence, the flashlights using regular AA or D batteries are not compatible with 18650 batteries nor are these batteries interchangeable. Apparently, the size difference of the cells will prohibit their use for a particular torch. Due to their high power outputs and capacities, 18650 batteries tend to need small computer chips to protect them from overcharging or deep-discharge levels. Besides drastically damaging the cells, reaching these charge levels can potentially make the battery combust, or even explode. Battery protection can range from minimal to full. Batteries with comprehensive protection need little supervision and will not be affected by overcharging or deep discharging. On the other hand, batteries with minimal protection may require some supervision, although it may tolerate a certain, albeit small, amount of overcharge or deep discharge. Incidentally, raw batteries with no protection are also available but will require more care and maintenance. You may have heard or personally encountered the memory effect phenomenon in batteries. The memory effect causes a battery to lose its ability to hold a charge. This effect takes place when a battery is frequently recharged before reaching full discharge. It would seem that the battery “remembers” the point where it is repeatedly recharged, hence the name. For example, if you frequently recharge a battery that has 25% available power, it may consider that point its discharge state. So, that remaining 25% will effectively become zero. Most noteworthy, though, about the 18650 battery is that it is not affected by the memory effect common in non-Li-ion cells. An important factor to consider when you want to buy an 18650 (or any battery for that matter) is their specifications. The three most important specs to consider are the battery’s capacity and voltage. Depending on their brands and manufacturers, 18650 batteries will vary in these specifications. A battery’s capacity is the total amount of power or energy that it can store. This value is expressed in milliamps per hour or maH. You will find 18650’s in the range of 2000 to 3500 mAh. Regarding capacity, for instance, a battery rated at 3500 mAh has more stored energy than a 2500mAh battery. Hence, higher capacities will mean longer lasting batteries and ultimately, more bright light from your torch. Voltage, on the other hand, is a little more complicated. At the risk of angering engineers everywhere, I’ll attempt to explain battery voltage as simply as I can. However, you can skip this part if you have a working knowledge of electricity or a degree in electronics. You would usually find 18650 batteries in the ranges between 2.5 volts (or V, for short) and 4.2 volts. Obviously, Volts is the measurement for voltage. Simply put, voltage is the amount of force or pressure that pushes out electrical current from a battery into a device. Thus, a battery with higher voltage will discharge more power at a time. 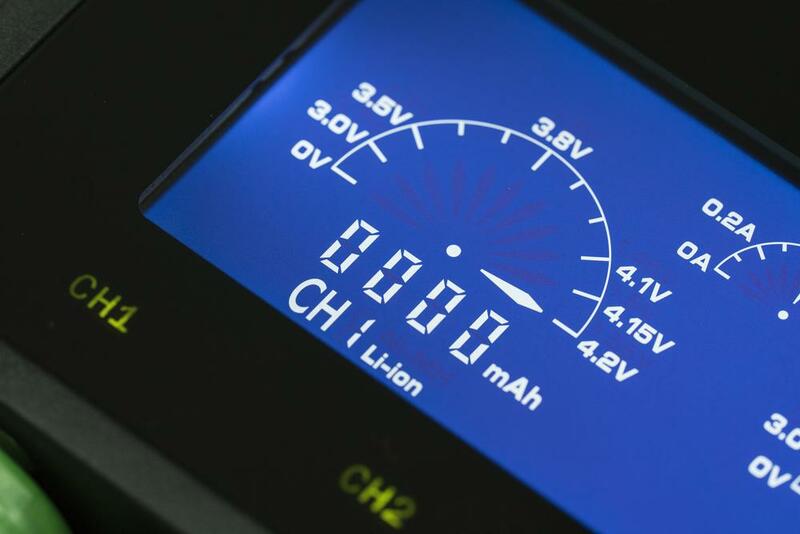 Understanding battery voltage is essential because electrical devices need differing amounts of power to function. For example, a remote control runs on lower power, so an AA or AAA battery rated at 1.5V will suffice. On the other hand, a high-power device such as a LED flashlight or a laptop would need a higher voltage rating. Manufacturers will boast of their respective batteries’ capacities as well as their high cycle life. Thus, you’ll also spot “cycles” or “cycle life” on battery specifications. This term signifies the number of cycles that you can expect from a battery until its overall capacity drastically declines as the battery’s health deteriorates. Take note that one battery cycle involves charging the battery to full capacity and discharging to or near deep discharge levels. 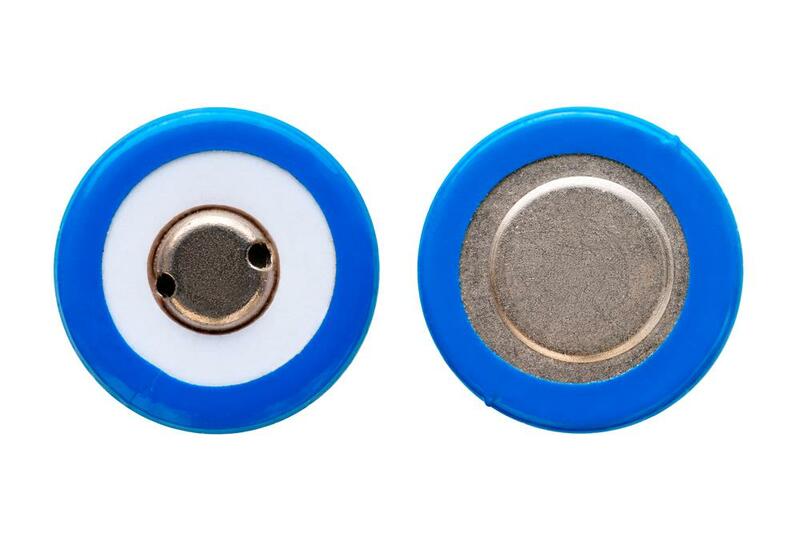 As you peruse the different kinds of 18650s, you’ll notice that some of them have the familiar button top that regular batteries have while others sport a flat end. However, these features do not necessarily mean that one has overcharge/deep discharge protection, while the other does not. These features vary among manufacturers as well as the batteries intended purpose. The best batteries will, of course, require only the best battery chargers. You wouldn’t want to buy a cheap and dodgy charger for your expensive 18650’s that you expect to last for a long time. Moreover, specialized and higher quality chargers do much in protecting your batteries as well as extending their lifespans. Although some of the batteries we’ve reviewed have pre-included batteries, they’re often at a lower quality when you compare them with premium battery chargers. So, we’ve also examined for you three of the best battery chargers in three different categories, namely the best in value, in quality, and the best in the smart charger category. Finally, you may notice that chargers from Nitecore dominate our list of the best chargers. And for a good reason. Nitecore, in our opinion, leads the market in the 18650 battery chargers and most likely in other battery categories as well. 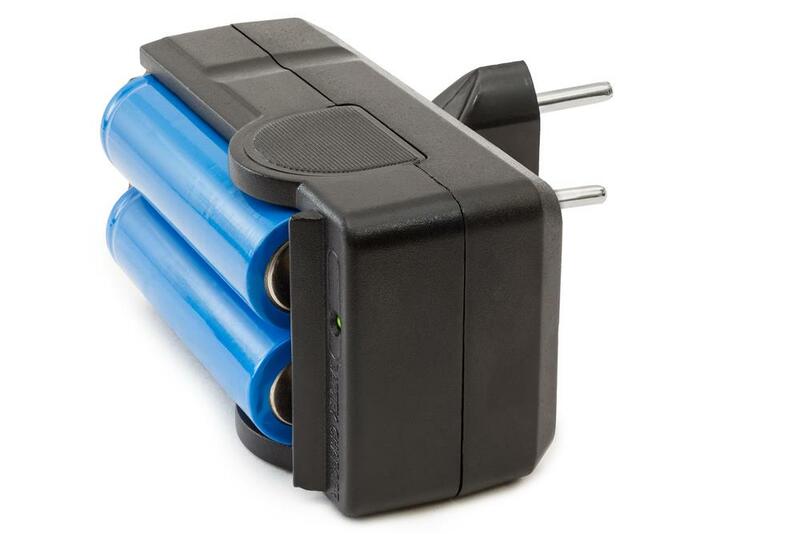 Although you may find quality chargers from EBL or Xtar, we recommend these three from Nitecore. Although the Nitecore i2 is far from the smart charger category, the charger will still show you the charge level of a vast selection of compatible batteries via LEDs on a black panel. The panel indicates 30, 80, 100% charge status. Additionally, this 2016 version of the i2 boasts twice the charging speed of the older i2. This charging rate is possible due to the 1000mA max output on the new i2. Also, the i2’s Active Current Distribution technology automatically detects your current battery capacity and gives it the required current. Another feature of the new i2 is the battery charging time of each of the batteries in the bay. Moreover, the i2 automatically stops charging when a battery has exceeded 20 hours on the charger to prevent and potential overheating. All in all, with all these features in a two-bay multi-compatible charger, the new Nitecore i2 is the charger with the best value. The Nitecore i4 is effectively the big brother of the i2 which is also an upgrade to an older i4. Hence, all the features and technology found in the i2 is also present in the i4. Also, like the Nitecore i2 with its auto-shut off for overheating protection, the i4 adds another protective layer with its durable ABS fire retardant material. Obviously, the i4 has four bays for simultaneous battery detection and charging. That’s right. 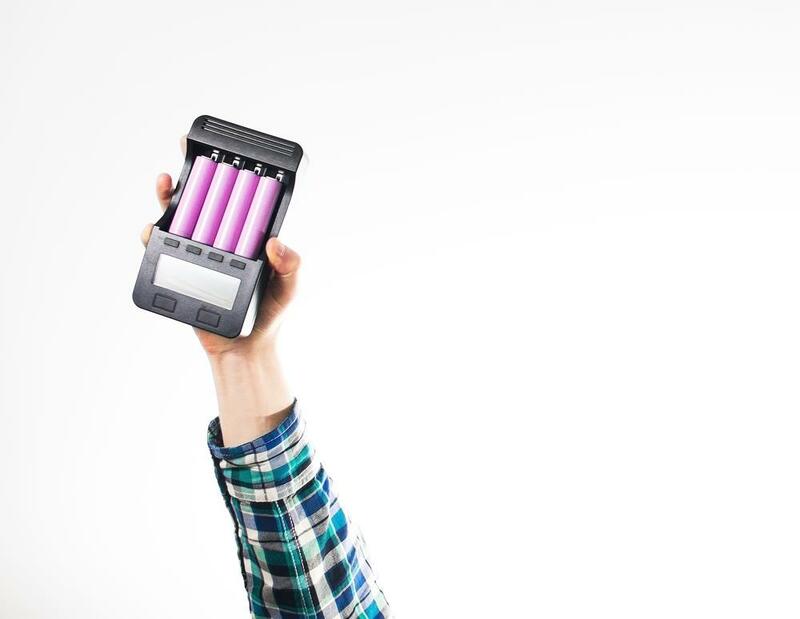 All you would need to do is take your battery of choice, whether it’s any rechargeable Li-ion, Ni-MH, or Ni-Cd and place it on the multi-battery slots. Afterward, the charger will do the rest. Once you put a battery in a bay, the i4 automatically detects the battery type and its required current, as well as its charge status and voltage requisites. Finally, the charger will know the correct charging mode, which would be among three—Constant Charge Current (CC), Constant Charge Voltage (CV), and Trickle Charge. Also, you need not worry if you, by accident, place a non-rechargeable battery in the bays. The Nitecore i4 will detect the non-rechargeable battery and will not turn on charging currents in the bay. Ultimately, this enormous collection of features makes the Nitecore i4 the best quality charger in this category. So, we’ve looked into the numerous and quite incomparable features of the Nitecore i2 and i4 battery chargers. Now, take all of those features, four battery bays, worldwide insurance, then add the upgrade of a digital LCD and you get the powerfully versatile Nitecore D4. The backlit LCD screen displays the charge status, the battery voltage, the present current, as well as the time that has passed. You’ll be able to scroll through this battery info via two conveniently located buttons on the side of the device near the screen. These buttons also toggle the LiFeP04 mode and also lets you turn the LCD to sleep. Like its smaller siblings, the D4 does not skimp on safety with its fire-retardant material couple with all the security features of the i2 and i4, including the auto-off features, overcharge prevention, as well as a feature that detects if you’ve erroneously reversed the polarity of the batteries in the bay. The Nitecore series are already smart enough. The D4, however, takes this to another level with its LCD earning this multi-voltage, multi-battery, and multi-chemistry charger the title of the best smart charger. Containing power 3 to 4 times more than standard AA batteries means 18650’s don’t come cheap. It is important then that you properly maintain your investment and handle them safely. Buy a reliable 18650 battery chargers. Cheap and Inferior chargers run the risk of damaging your batteries or worse, combustion and explosion. Dispose of your batteries properly and never in a fire. Use batteries of the same brand. Keep batteries away from pets and young hands. Keep batteries in your charger or device, even if they have protection or not in use. Open, damage, or disassemble your battery. Keep loose batteries in your pockets. Expose your batteries to high temperatures. Finally, let’s now go into our list of the best 18650 battery for a flashlight. You’ll notice that the first two are just battery packs while the remaining three have chargers included. Hence, you may choose among these options depending on your current need. 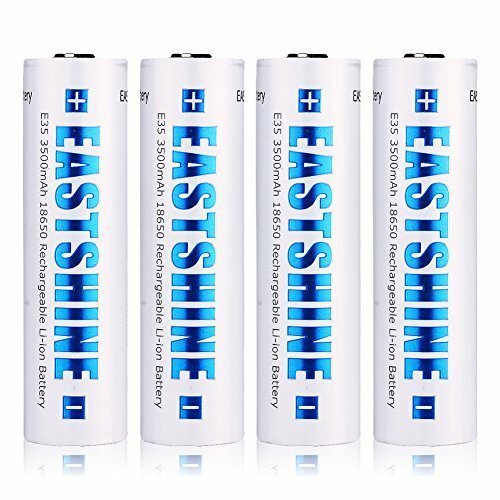 The button top 3.7V 18650 rechargeable batteries from Eastshine are a veritable bunker with its protective features. The nickel-plated ends, for instance, makes the batteries resistant to impacts; the metallic film enveloping the battery protects against scratches and abrasions; while the all-important charge protector keeps the 3500mAH battery capacity safe from overcharging, deep discharge, and short-circuiting! The batteries from Eastshine feature very high power capacities as well as full protection from overcharging, deep discharging, and short-circuiting. Remarkable safety features, including impact resistance. A thick outer shell for protection against scratches as well as abrasions. The E35 may be pricey for some. The 3.6V flat top batteries from Samsung may come in a more raw state as opposed to the batteries from Eastshine but they perform as you would expect from the popular and reliable South Korean Brand. Additionally, it’s lower 2500mAh capacity means it’s capable of a much higher energy output. Conversely, some care is needed as being raw means there are no charge protection features in place. 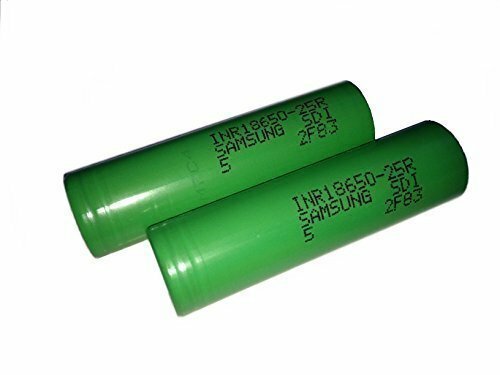 The batteries from Samsung have a high power output. This battery comes from a famous and also brand. The INR18650 features quick charging times. The absence of overcharge or deep discharge protection will mean more care as well as supervision during battery handling. There is a small risk of short circuiting due to improper handling. The Samsung INR18650 is on the lower end of power capacity. The button top Outlite 18650 batteries feature a deep reservoir of 3600mAh at 3.7V, juicing your flashlight for much longer! Additionally, the Outlite batteries have the needed protection from overcharging and deep discharging ideally complementing the two-bay 18650 battery chargers package. Also, you can expect fully-charged batteries after 5-7 hours on the pre-included charger. 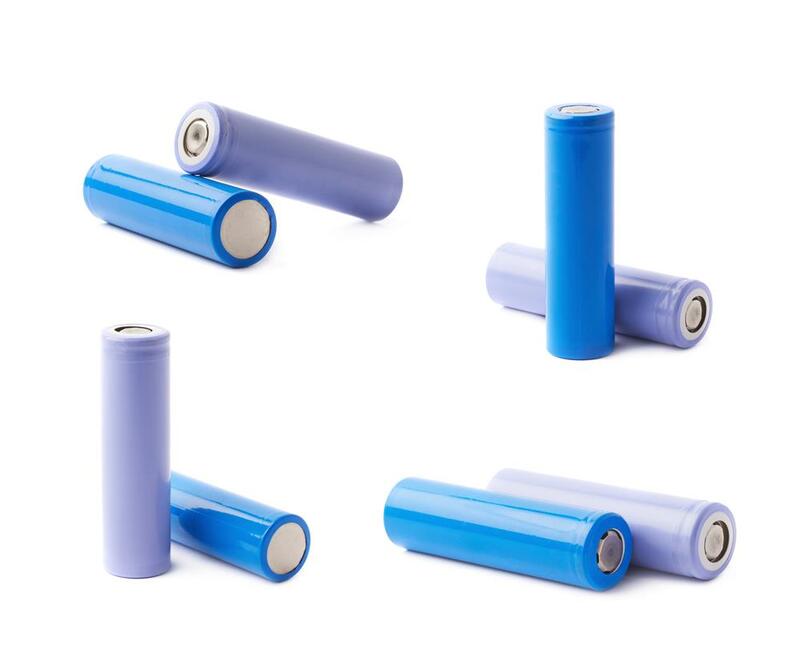 The batteries have a very high power capacity, long cycle life, and also sports protection from overcharging and deep discharging. 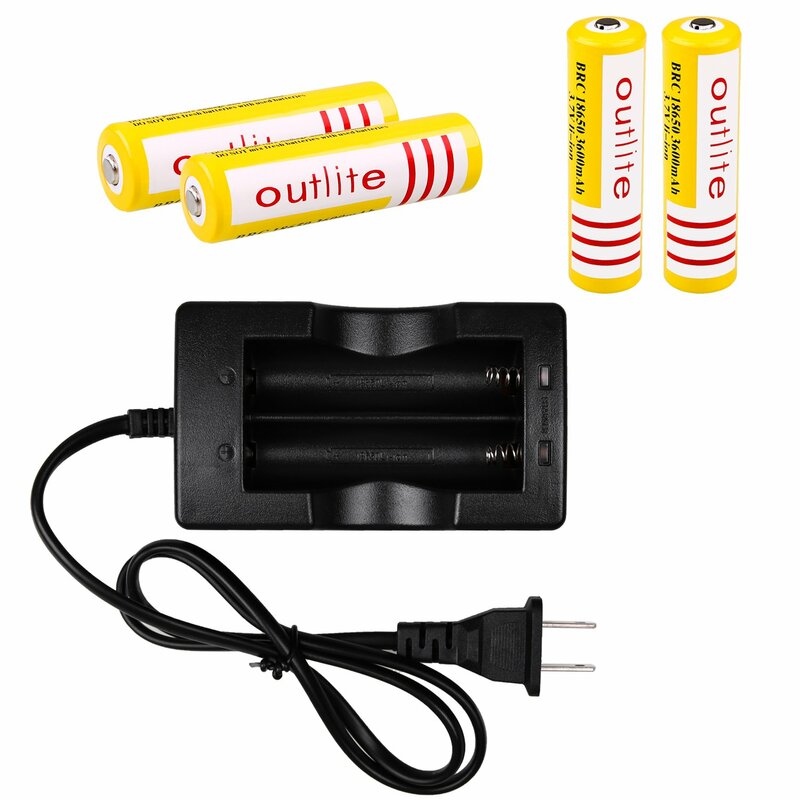 The Outlite battery charger that comes with the batteries charge very quickly and efficiently. Also, the charger has an indicator light that tells you when batteries are at 100% charge. The Outlite batteries do not feature full protection such as protection against short circuiting or impacts. 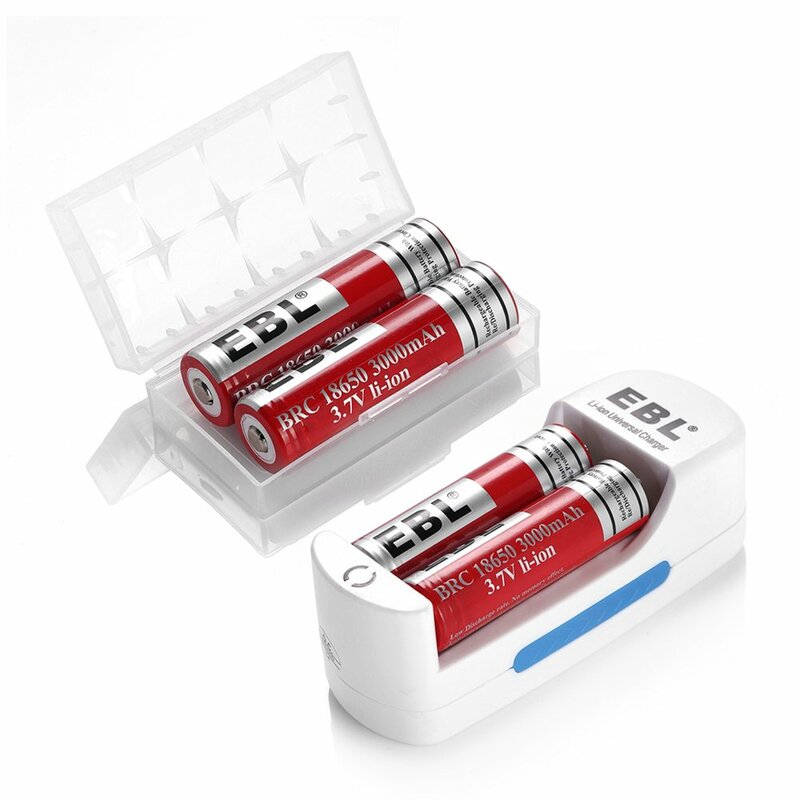 Another 18650 battery set pre-packaged with a two-bay charge are the ones from EBL. These button top batteries have a capacity of 3000mAh at 3.7V. Moreover, the EBLs feature degradation protection during charge and discharge cycles which help extend the battery’s lifespan! Also, you’ll be able to protect your precious batteries further with the pre-included battery case. The EBL batteries feature high energy capacity, high power output, and also an extensive cycle life. The batteries also had a low self-discharge rate if you will keep them in storage. The charger that comes with the batteries run quick and efficient. The batteries feature minimal charge protection. 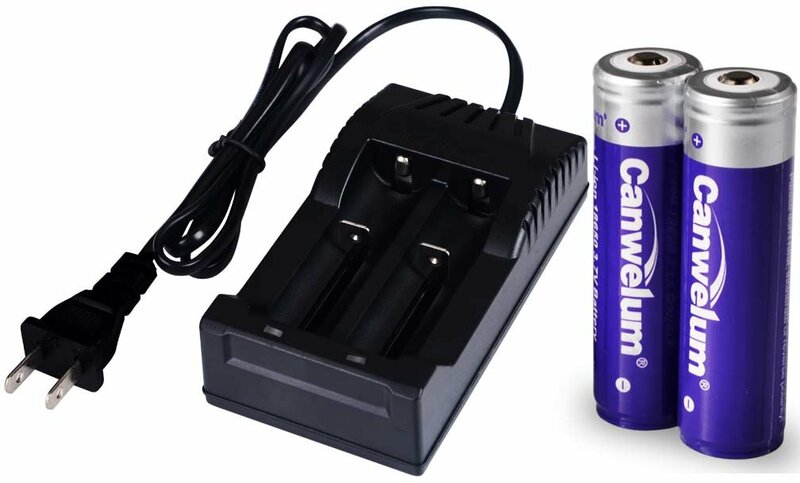 The Canwelum batteries have full overcharge and deep discharge protection. Besides its quick charging features, the bundled charger is well made. The battery bundle contains only two 18650 batteries. Battery capacity is on the lower end. The 18650 batteries are the life and also breathe of your flashlight. Therefore, you should choose the batteries that will serve it best. You can’t go wrong with our top 5 best battery for a flashlight. Of course, you’ll have to take into account how you would use your flashlight. Are you a light user who would more frequently keep your flashlight in storage, ready for emergencies or quick-fixes in the dark? Then a battery with a lower power capacity may be ideal for you. Or are you the traveling, happy camper who brings his trusted and powerful torch wherever he goes to illuminate the darkest corners of wilderness? If you’re like us, then you’ll need the EastShine ﻿﻿﻿E35 with its markedly high power capacity! Also, you’ll also get its vast protective features for the safest travels! However, if you’re also looking for a charger with your 18650 batteries, then the battery bundle from Outlite will fit you best! We hope we’ve shed light on your quest for the best 18650 battery for a flashlight. Let us know if you’ve suggestions, comments, or other battery options!